Economy and Ecology are interlinked and if you want to reduce your ecological footprint as well as your expenses, we invite you to join the LEAN & GREEN Programme and the LEAN & GREEN Club. 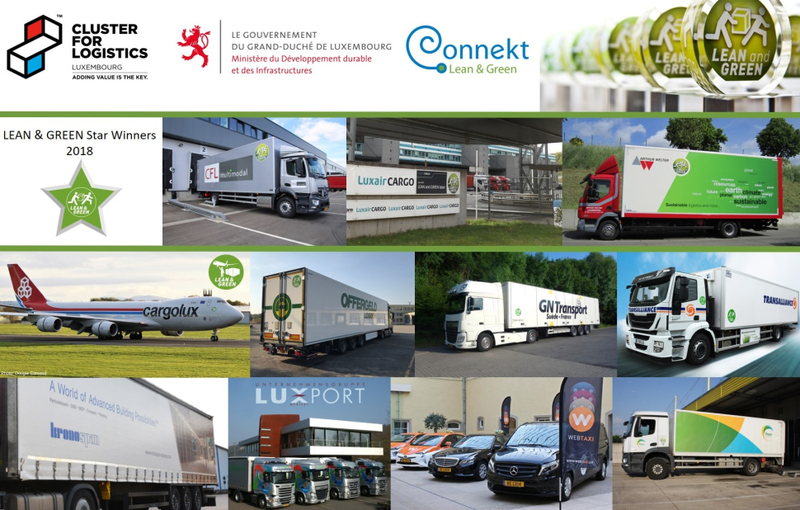 The Cluster for Logistics coordinates the international programme in Luxembourg which aims to reduce the CO2 emissions of logistics activities by at least 20 percent in 5 years. The project is possible with the cooperation of the Ministry of Sustainable Development and Transport. LEAN and GREEN is an international stimulation programme for businesses and authorities, implemented by Connekt: a Dutch non-profit network for sustainable mobility. It aims to encourage businesses and government bodies to move to a higher level of sustainability, by taking measures that do not only yield cost savings, but reduce the burden on the environment at the same time. The LEAN and GREEN label was launched in Luxembourg on June 25th 2014. A third party audits the Sustainable Logistics Label, making sure it withstands the requirements of authenticity needed in Europe. One programme - multiple advantages: The programme is compatible with sustainable requirements like Objectif CO2 (France) and can be a gateway to comply with existing or upcoming mandatory regulations. This programme helps you to get in line with the objectives like COP 22 and labels like Iso 14001 or EU Eco-Management and Audit Scheme (EMAS). Savings mean savings: Reducing your emissions by 20% is not only an ecological action but provides also financial benefits. By joining the movement, you automatically make your process leaner and reduce your costs. You can't enhance what you don't measure: The programme enables you to get an overview of your transport related processes and your ecological footprint. By following our calculation methods, you will learn how much CO2 you produce - and how you can reduce that. Wide recognition: The label is broadly recognized while the programme itself is now available in the Netherlands, Belgium, Luxembourg, Germany, Italy, Spain and Czech and Slovakia. Companies that have achieved the Lean & Green 1 Star level can also join the Europe-Wide programme. Lean & Green Europe supports the incorporation of various national sustainability programs into a European label. Find new solutions and collaboration possibilities: After achieving your programme and receiving the star label, the key to further excellence are collaborative projects. One star-labeled companies are capable to look together for new ways to enhance their savings even further. Stronger together: Instead of working out how to reduce your emissions by yourself, we provide solutions in a community approach. Next to the individual support, common workgroups bring together all the actors to learn from each other. While every company has different requirements and challenges, it is possible to find new solutions by broadening your point of view. Enhanced customer acquisition: You can differentiate yourself from lowcost competitors who show no concern for environmental questions by providing this genuine ecolabel to your existing and potential customers. Shippers expect sustainable services and are increasingly refraining to work with companies that have no or low standards. The Network always wins: The LEAN & GREEN Family spans now over 400 members. When you participate, you can access this community to find new solutions and solution providers. The label also facilitates access to other LEAN & GREEN companies and its ambassadors like Christophe Campe, Manager of CHEP Germany. The first four companies to win the award in May 2015 were Arthur Welter, CFL Multimodal, LuxairCargo and Post. The companies Cargolux, GN Transport, Transalliance and Offergeld took part in the second edition and received the awards in June 2016. Luxport Group, Kronospan and Webtaxi participated in the third edition held in 2017 and received the label on February 2018. The public-private network Connekt took the opportunity of the 2016 ceremony to unveil new programs such as LEAN and GREEN Europe dedicated to transborder collaboration in Europe and a label dedicated to the aviation sector. The program ambassadors CHEP, AB Inbev, HP, Heineken and Unilever launched the programme, dedicated to transborder collaboration in Europe. As from 1 July 2016, companies can achieve their Lean & Green Award for sustainable logistics at a European level, eventually aiming at five Lean & Green Stars for zero emissions in logistics. The LEAN and GREEN for Aviation programme takes in consideration the particular nature of the aerial sector and has set the reduction minimum to 10 percent. This achievable goal is an incentive for airfreight and passenger airlines to join the programme and thus reduce the amount of CO2 by a high amount. Cargolux is a proud forerunner, and received the award for its plan to reduce the by 10%. The sponsors of the award ceremony 2016 Goldbeck, Goodyear and ProGROUP are also founding partners of the new Club LEAN and GREEN launched by the Manager for Logistics Cluster, Mr Malik Zeniti. The new club is open to all companies that want to enhance their ecological footprint. The club is aimed to help participants and service providers to share best practices, i.e. : tire usage, alternative fuels, multimodal projects or transport optimisation systems. The Ministry of Sustainable development and the Cluster for Logistics collaborates with Logistics in Wallonia for the implementation of the Label for logistics companies in Luxembourg. If a Luxembourg-based company can demonstrate through an action plan that it will be able to reduce its CO2 emissions by 20% in five years’ time, it becomes eligible for the LEAN and GREEN Award. Informative documents can be downloaded at the bottom of this page. Initiated in the Netherlands in 2007 by the agency Connekt, the LEAN and GREEN phenomenon now concerns more than 400 companies in the Netherlands, Italy, Belgium and Germany. This label is becoming an essential European recognition and welcomes the proactive companies in protecting the environment. Connekt is a Dutch non-profit network for sustainable mobility. It aims to encourage businesses foster innovation in Green Logistics, by taking measures that not only yield cost savings, but at the same time reduce the burden on the environment. The Cluster for Logistics centralizes the information and subcontracts part of the project to Logistics in Wallonia and the company Dart. The programme is accessible to any logistics company, says Emilie Parthoens from Logistics in Wallonia. Workshops and meetings shall help companies to work out a sound reduction plan. The company Dart, represented by Nicolas Rigo, has the mandate to evaluate the plans. The Cluster for Logistics Luxembourg is the fifth European chapter allowed to award the ecological label LEAN and GREEN. Max Nilles of the Ministry of Sustainable Development and Infrastructure, Charles Gosselin of the Cluster for Logistics and Nico Anten, Managing director of the Dutch agency Connekt signed the agreement in order to encourage logistics businesses to move to a higher level of sustainability. If you are interested in joining the initiative or require more information, please contact the Cluster for Logistics via mail or phone.